This tip will show you how to add a database to your trusted locations. 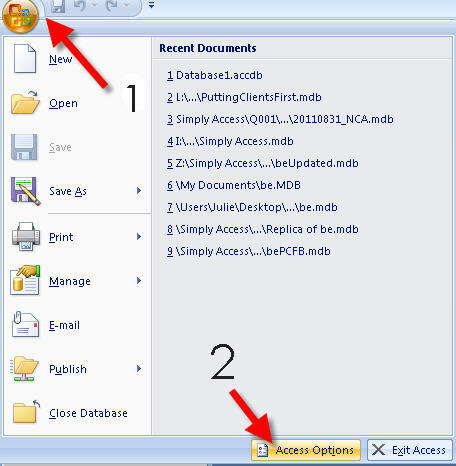 When you open or create a database in Microsoft Access 2007 or Microsoft Access 2010, and include VBA code and/or some Macros then you have to add the path of the database as a location of trust, for the code or Macros to work. This will open ‘Access Options’ window. 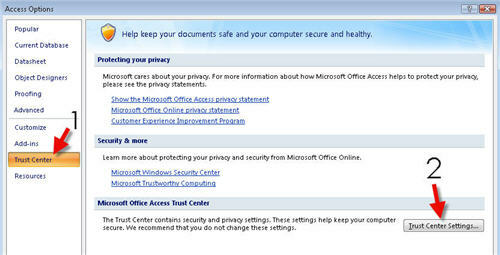 On the left hand side, there will be a list, click on ‘Trust Center’ (1), and then click on ‘Trust Center Settings’ (2). **This will open the ‘Trust Center’ window. On the left hand side, there will be another list, click on ‘Trusted Locations’ (1). If your database is on a Network make sure the tick box ‘Allow Trusted Location on my Network (not recommended)’ (2). Even though it says not recommended, if your database is on a Network, and you want the code to work, then there is no other option. Finally click on the ‘Add New Location’ button (3). This will open the ‘Microsoft Office Trusted-Location’ window. Click on the browse button, and navigate and locate your database (1). If you wish to include subfolders make sure the tick box ‘Subfolders of this location are also trusted’ (2). Then click ‘OK’, ‘OK’ and ‘OK’ to close the 3 windows. This method, covers when you open a database and you get the following error message just under the ribbon; ‘Security Warning Certain content in the database has been disabled’, click on the options button. This will open ‘Microsoft Office Security Options’ window. 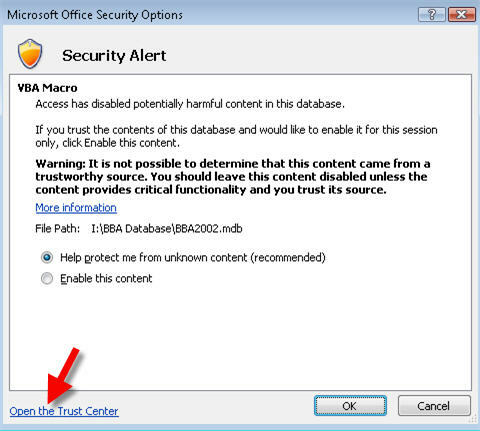 Click on ‘Open the Trust Center’ and then follow on from ** in Method One.